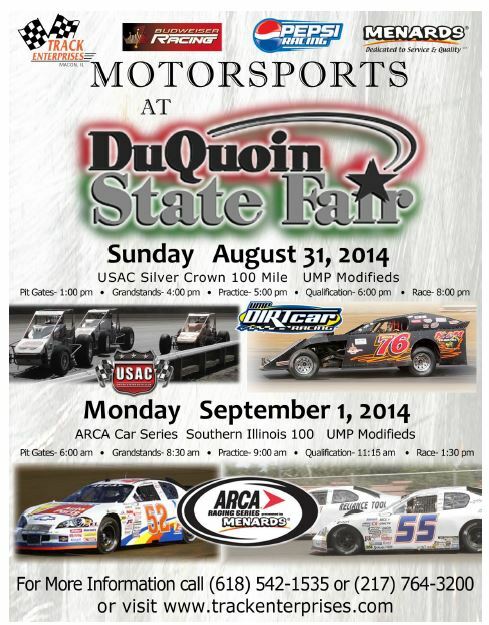 (TOLEDO, Ohio – August 22, 2014) – The ARCA Racing Series presented by Menards will soon be making its annual trek to southern Illinois for the Southern Illinois 100 on the DuQuoin State Fairgrounds mile dirt Labor Day Monday, September 1. This year’s annual championship stock car classic, with the 92nd annual DuQuoin State Fair serving as the backdrop, marks the 61st running of the Southern Illinois 100 presented by Federated Car Care. It will also mark the final leg of ARCA’s 2014 Bill France Four Crown championship with just 45 points separating the top-six contenders. Currently, GMS Racing’s Grant Enfinger leads by 15 points over Ken Schrader Racing and Venturini Motorsports, tied for second. The Bill France Four Crown championship represents ARCA’s versatility and provides a link to the series’ roots, featuring a diverse combination of tracks in any given season. This year’s France Four Crown schedule included the New Jersey Motorsports Park (road course), Chicagoland Speedway (superspeedway), Berlin Raceway (short track), and DuQuoin (mile dirt). Bill France Four Crown points are allocated without qualifying or in-race bonuses, and distributed in the same method as in the official series standings. Five-time Southern Illinois 100 winner Frank Kimmel is the all-time Bill France Four Crown champion with seven titles (2013, 2008, 2007, 2005, 2002, 2001, 1998). The annual Bill France Four Crown reaches back to 1984 when the late Davey Allison was the first recipient/champion. Expected entries at DuQuoin include 10-time ARCA national champion Frank Kimmel and three-time DuQuoin winner/ NASCAR veteran Ken Schrader. Schrader’s win in last year’s race cemented him in as the oldest ARCA winner in history. Schrader turned 59 in late May, 2014. “That would be high, high on our list of accomplishments if we’re able to pull it off,” Schrader said of the Bill France Four Crown title. In addition to the steady cast of characters, the Southern Illinois will feature several home-state drivers including Illinoisans Shane Cockrum (Benton), Kelly Kovski (Springfield), AJ Fike (Galesburg), Mark Littleton (Arenzville) and Dale Shearer (Alhambra). The event will also feature a tight national championship points battle between Enfinger and W. Des Moines, Iowa’s Mason Mitchell…the two have been flip-flopping the lead back and forth all season. Mitchell finished second last week on the Springfield mile dirt with Enfinger trailing in third. The past winners list of the Southern Illinois 100 includes some of the most widely-recognized names in American motorsports. Jay Frank won the inaugural Southern Illinois 100 in 1950. Just some of the winners who would follow include Marshall Teague, Indy 500 winners Jimmy Bryan and AJ Foyt, Fred Lorenzen, Don White, Norm Nelson, Jack Bowsher, NASCAR champions Rusty Wallace and Tony Stewart, Bob Keselowski, Billy Thomas, Ken Schrader, Parker Kligerman, and current NASCAR Nationwide Series driver/winner Chris Buescher.